“He fell in the early part of a Summer evening in his seventy sixth season. He was the one they called Hadahgihgr<hta` “he is the clouds descending”. He was asked to be chief for the Snipe Clan of Cayuga Nation, a tribal connection which came to him by his mother Elisabeth Skye who died when he was just a baby. Tey/h/wé:tho is fortieth on the role call of the great Hotin/sh? :ni (Iroquoian) Confederacy brought to the People by the Peacemaker long before the coming of the “white race”. His title bathed with meaning in the ambiguities of deep responsibility conveyed to our chiefs - “he is so real in a double way”. In him was a simple man with many skills, a complex man of deep wisdom, a man whose nature was a beautiful balance of compassion and authority, a private man who gave openly, a man so much in his body, heart, and mind altogether. The People simply loved him because he was so generous, so “nice”, so without judgment, so in his Good Mind. And he loved the People. Now he is gone. His good friend George Garlow always called him Jacob, some knew him as the Chief, but most of us spontaneously called him “Jake” which he enjoyed and which showed how close a friend he was to each of the People. These people were first his family, Snipe Clan, Cayuga Nation, Hotin/sh? :ni Elders and friends, all the people of the onkwehón:we - “people of the longhouse” and, in the tradition of the Great Law, all the people of the four directions of the four White Roots of Peace. He assumed his roiáne duties with vision, courage, depth, energy, humour, imagination, dignity, modesty, freedom. He knew who he was - “I have my culture; I have my language.” He spoke three of the Iroquoian languages fluently - Cayuga, Onondaga, and Mohawk. He could understand and speak Oneida and Seneca. And he was a fluent speaker of English, which we sometimes forgot, for which we were grateful when he taught our ways to us who do not freely speak in our native tongues. His eloquence in English touched many hearts and arrested many minds. He only spoke and acted out of the teachings of his own profound Hotin/sh? :ni lifeways and his own life experience given to him in Creation - ““I don't know much, but what I do know, I know a lot of!”. Ever present, underlying all the weighty matters of life, were his enjoyment and humour - he loved the giddy laughter of the women, the quiet giggling of the children, and clandestine humor of the men among the gentle and radiant ways of his onkwehón:we family. Now we remember how he fell, how we picked up his body, dressed him in his “indian” clothes, placed him in a maple box, talked to him as he went about his many travels, fed him with each meal, celebrated him at Sour Springs Cayuga longhouse, put his body into the ground, condoled his Clan, and finally, in the Ten Day Feast, give away his clothes and things among the people. We are left with a large opening which we must all fill to tighten down the culture which was loosened when he left us. He held us each, his People, in such a “good way”. One man cannot 'hold up the tree” by himself for too long. He has left us, to free us, to help him now. The sky has opened, the clouds have parted. for the parting of one of her most giving children. to compose the song on my latest CD, The Code of Handsome Lake. Jake devoted his life and work to spreading The Good Word. the loving presence of Jake Thomas. of peace and love among mankind. London England, August 18, 1998. What words can describe the actualities of his life? His house was the longhouse of the forest canopy of the Eastern Woodlands, washed in the spring waters, rivers, and falls of the veins of the Mother Earth. The hills here afford a wider view; the valleys a flat place to wander near the waters; the marshes provide sanctuary for our flying, swimming, and four legged relations; the meadows open to the skyfield of the ancestors. This house, established by the Great Law long ago, extends from the Cohoes Falls along the Mohawk River to the Genesee Valley and Niagara Falls at the western door. Here the nations are mingled among the fresh waters of the Finger Lakes in what they now call New York State - Mohawks, keepers of the eastern door; the younger brothers, the Oneidas, the standing stone people; the firekeepers, the Onondagas; his own mucky land people, the Cayugas; keepers of the western door, the Senecas; and our adopted brothers, the Tuscaroras. In the diaspora of the American Revolution some of the most traditional Hotin/sh? :ni people emigrated across the Niagara Falls under the leadership of Joseph Brant to what has today become the sanctuary of the Hotin/sh? :ni memory, Six Nations in Grand River Territory. This is where Jacob Ezra Thomas was born. He came to us profoundly out of the Mother Earth whom he loved so much, skin brown like the good soil of his mother, a memory informed by the Ancestors held in the power of the land, and among a large extended community of all his relations at Six Nations and spread throughout the many Hotin/sh? :ni communities surrounding the Ganadarí:io Lake Ontario - “the beautiful waters” which still centers the sacred occupations of our People. Some say his was a special birth coming with the mantle of wisdom - a caul over his head - at Midwinter of 1922, born of Elisabeth Skye Kowahé:ki, who died a mere year and a half later. He was raised by his maternal grandfather, Tyó:tyo, David Skye, his father Ashaekó:nah, Dáwit Thomas, and his paternal grandmother, Julia Thomas. From these our Elders he began to receive an education in traditional knowledge and life ways. His first language was Onondaga. His maternal grandmother Kowanetshí:neh “someone is leading her” gave him his name Hadahgihgr<hta - “he is the clouds descending” from the role of the Sandpiper Clan. In 1942, Jake received a “draft notice” to report for military duty in the Canadian forces to fight in a “war to end all wars”. World War II had begun, and the dark forces of Europe's own “shadow” were rising in ecstatic degradation. Many of our young Hotin/sh? :ni men were eager to go, destined to know the trauma of witnessed rampant destruction, and the colonizing forces of male dominance and the lure of money for sustenance. Most would never be qualified for Chief's titles after killing, and many would have little desire or respect for traditional ways after visiting Europe and gaining the intimate camaraderie of “white” brothers in the male bonding rites of welfare. Jake had, and would continue to live a simple life anchored in the body of aboriginal being. His father, Dáwit Thomas Ashaekó:nah “big knife” was adamant that Jake was not to respond to his draft notice. As Jake says: “They never came after me - so I stayed home!”. A year later he joined with Tewatya:té:tus Doris Keye to receive into this world what would become a large family of fourteen children. But more importantly, his father, the Elders, and Chiefs took it upon themselves to begin an intensive teaching of this now precious “young man” into the traditional ways which had been handed down to them in the oral traditions in ancient ancestral generations going back before the Peacemaker. Jake already enjoyed carving, and made ceremonial Hadówi masks for the healing society after he was given his own healing in the Little Water Medicine ceremony delivered by the Gourd Society in the 1934 when he was twelve. He loved dancing dancing and singing in the traditional longhouse ways, which he had mastered in the energies of young manhood. In 1940, they had even made him a Faithkeeper in the Onondaga longhouse of his father. He himself was Cayuga, Snipe Clan, by virtue of the matrilineal lineage of the Hotin/sh?:ni. This early part of his life was the preparatory “setting” for his profound “rite of passage” into the depths of Hotin/sh? :ni ancestral memory about to begin with the onset of the Second World War. 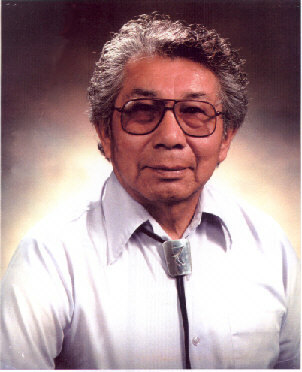 His father, one of the finest orators among the Six Nations and speaker of the Code of Handsome Lake, joined by Howard Skye, head faithkeeper of the Wolf Clan, Joseph Logan Jr., and Roy Buck - these men immersed him in the rigors of learning the entire cultural lexicon in the oral tradition. Jake remembered this time as an intensive, exhaustive, and continuous echoing of these elders, one thing learned each in its own time, as he himself would later teach. The war passed, the responsibilities of a growing large family mounted, and then Tey/h/wé:tho died of cancer in 1964, and the burdens and even depression of being a single father almost overwhelmed him as he confronted the pressures in a brief encounter with alcohol. In the compassion, his people found him a “friend” in Ray Spragge Haoyé:nes “he makes the sky fall”. This “medicine friendship” was confirmed in he Eagle Dance Ceremony in 1965 and he was made a deputy to the Cayuga Chief Augustus Williams. In 1972 when the chief died, his Clan Mother Kayátes “falling body”, Ida Skye asked if he would assume the title Tey/h/wé:tho. He declined as unworthy and perhaps intimidated by the extensive duties and “good mind” he understood he would have to assume. Kayátes accepted his answer. One year later, realizing her responsibility, his Clan Mother arranged a Condolence, and advised Jake that he was to be condoled as their Chief. He surrendered. In 1976, he was wrested from the peaceful isolation of the traditional world of Six Nations, to give his knowledge over in an academic teaching position offered to him at the newly founded, and ground breaking, Native Studies Program at Trent University in Peterborough, Ontario. He accepted after much cajoling and convincing by the charismatic visionary and Chair of the program, Joe Couture. Jake taught for fifteen years, building a reputation as a respected teacher based solely on the traditional educational system out of which his knowledge came (he had a grade 4 education at Six Nation's Thomas School). When he was required to “retire” at age 69 they made him Professor Emeritus of which he was very proud. He returned home to found the Iroquoian Institute to further his teaching, and after its dissolution and his separation, he founded the Jake Thomas Learning Centre in 1993. These were traditional institutions under which he “broke new ground” by conveying The Great Law in English language (1992, 1994, and 1996 at Six Nations) so that people who did not have native language could learn once again the “good ways” of their ancestors. For the first time in our long Hotin/sh? :ni history it was recited in English for all people to hear. These were culturally daring and historic recitations taken on as responsibilities from the Ancestors, ignoring community criticism to open the gates on traditional knowledge for the “coming faces”. Among these were the relations he nurtured including 45 grandchildren, 53 great grandchildren and a great, great grandson. Jake was at Ganondagan Seneca Historical Site south of Rochester, New York for the nine days previous to his death at the Youth Leadership Training Camp and Gathering of Elders where he taught 60 young people the Great Law. He began his last day before dawn. He performed an extended Burning Tobacco into the rising sun, Our Brother. He finished his recitation on the last section of the Great Law with singing the Hai Hai Hymn calling the Ancestors. Following his speaking, the Ad?wa song was sung to him by young Blaine Tallchief and Pete Jemison, each walking him up and down, in turn. The young people, Elders, and friends then formed a procession to pass by him and offer gratitude individually. Afterward he had lunch and was driven home to Six Nations. As soon as he arrived at the house about 5:30 pm, he went out to his garden - scurrying like a rabbit to see what had grown while he was away. He sent me home with corn, tomatoes, cucumbers, and some fresh brine pickles from his workshop. One hour later he was struck with the chest pains. Alone together with his wife Yvonne, they struggled into the car for the short drive to Hagersville Hospital. Ken Maracle called Cayuga Chief Harvey Longboat Deskaheh”to come to the hospital to remove his horns”. Harvey arrived shortly to carry out his sad duty. Jake was later taken to Henderson Hospital in Hamilton where he was declared dead at 12:03 am on Monday morning, August 17, surrounded by family. In the early morning hours of the First Day at his home, the women began to cut and sew his “indian clothes”. The men arrived to build a ramp into the house and set up vast tents in the yard to receive the people. The house was cleaned and everything removed from the walls. Some of the men were chosen to go to dress him at the funeral home when the clothes were finished, and Chief Cleveland General waited to “talk” to Jake when he arrived. Two nights were passed quietly with many people gathered around his body, while his spirit travelled many places, always yearning to return to eat and to be with us. In these long nights the children came to play the deer horn and button game, guided by his spirit - their soft laughter punctuated the depths of darkness. On the Third Day, his body was taken to the Sour Springs Longhouse for the funeral speeches by Huron Miller and Cleveland General, followed by a review of the body by the many Chiefs, Elders, Men, clan mothers, women, and children, gathered from every Hotin/sh? :ni community and each Nation of the Great Confederacy he loved so much. We walked the body to a place in the fields near the Longhouse, and the men took turns filling the excavation. Two headboards carved from pine by his Cayuga brother and student Ken Maracle, were placed one at his head, the other at his feet, and we returned home for lunch. On the Fifth Day, the Chiefs on the “clear minded” side, the Mohawks, Senecas, and Onondagas came to speak the Fourteen Strings of the small Condolence for their grieving “younger brothers”, the Oneidas and Cayugas. Pete Skye spoke the words of condolence. Harvey Longboat and Cleveland General received them. An elaborate Condolence Feast followed with each of the people served in their order in the Confederacy beginning with the Mohawks, then in turn the Oneidas, Onondagas, Cayugas, and Senecas. On the Tenth Day, his wife, Yvonne was released from the Sandpiper Clan in the combing hair ceremony, followed by the give-away of Jake's clothes, conducted by Cayuga Chief Cleveland General. Then the Ten Day Feast was marked by the distribution of corn soup, corn bread, mashed beans, cookies, donuts, fresh fruit, and tobacco, into the baskets people had brought to take home with them. The sacred fire which had been burning in the woods near his sweat lodge during the ten days was tended for one last night. In One Year, a final feast will be held to release his spirit. The Cayuga Snipe Clan Mother will be looking for a “good man” to resume the duties of Tey/h/wé:tho. Jake was in the midst of writing the Great Law in Cayuga language. He was about to be filmed by the Center for Spiritual Democracy, in cooperation with The Jake Thomas Learning Centre, reciting the Great Law in Mohawk Language. His family and friends are determined to continue the work of The Jake Thomas Learning Centre. This will include the protection, recording, and publication of the vast archive which he left. The Centre hopes to complete its building project where it can to offer a resource center for traditional knowledge, an archive for students and researchers, and to continue teaching language, traditional knowledge, and native arts. Plans are being developed by his wife Yvonne Thomas for programs of counseling and guidance through the use of healing circles and “sweats”, to complete the recording of his work, and to create a study centre and archive. These future plans will be carried out by the People in duty and honour to Jacob Ezra Thomas. His beautiful, protected life was the prelude to a wider dissemination of Hotin/sh? :ni culture, first among his own people, and then out along the four White Roots of Peace, into the world at large, once again, as the Peacemaker showed. Countless people, young and old, traditional and Christian, native and non-native, benefited and were moved by the teachings he conveyed. Almost single mindedly, he revitalized and conserved in the most magnanimous and euonymus way all Hotin/sh? :ni culture and speaking for the coming generations. He understood the challenges and difficult changes which will be coming. Now he is gone, but his spirit will move in many places to help carry forward the pieces of our culture which he so generously transferred to each of us. And who is left to console them? For a Great Light has gone out. His song was Unity and Peace. Was broken with Pain for their Sorrow. For a year, his People will mourn. Of his Good Mind and Caring Spirit. On the “Death” of Jacob Ezra Thomas.